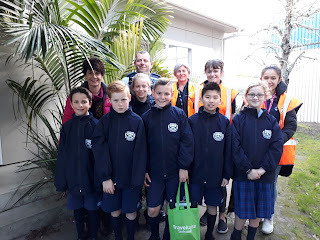 Today the Travelwise Leaders worked with Constable Merv, Mrs Venville and Marianne and her team from MOT to create a Time Zone Map. We split up and walked four of the popular routes to school recording where we were after 5, 10 and 15 minutes. Marianne has taken the data away and will create a walking time zone map which we will share with the community. This part of the Travelwise Leaders initiative to encourage our school community to walk rather than travel by car to school. Does Your Garden Have Food For The Bees? Sunnyhills Gets It's Travelwise sign!